Here at Rhine Valley Game Calls, we offer a selection of Creme Lures. There are a few posted on the Website, but more will be added soon. 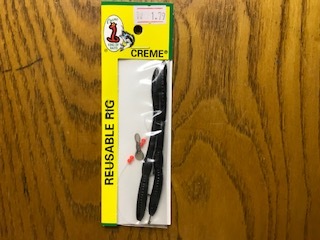 Creme Black Plastic 4 1/2" Worms (Pre-Rigged). Creme 3" (Purple) Replacement Tubes. Creme 7" Ribbon Tails (Brown) Soft Bait. Creme 6" Lizard "Watermelon Red"
Creme 6" Lizard " Watermelon Red" Soft Bait.